You've heard about "square dancing," but don't know much about it. Maybe you're thinking about it, or someone you know wants you to try it. What is it like? What can you expect when you go to your first class? This page will help answer these questions. First of all, even if it's called a "class," it's not the same as a class in school. You can leave your notebooks at home, and there are no pop quizzes. It's really just a period of dancing, with some instruction. The main purpose is to have a good time. All square dancing is done under the direction of a caller. In a class, the caller is also the instructor. This means that the caller (as the instructor) tells you what to do, how to do it, and (as the caller) when to do it. "Everybody make a big circle. Alternate men and women." But why a circle, when it's called square dancing? Don't worry, we'll get into squares soon. 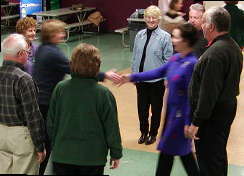 As you can see, all types of people square dance - youngsters, middle-aged, and older people. And you don't have to start out wearing funny clothes. "Everybody join hands and circle to the left"
You've now started square dancing! Yes, that's a real square dance call, and you're now a real square dancer. "Circle Left" is a very simple call. For most new calls the caller will give a few words of instruction before calling it. To do this call you go around the circle alternating right and left handshakes. The caller will give you more details in class; this is just a quick overview. We might learn a couple more calls while in a big circle, then break out into squares. "Every 4 couples make a square, aligned with the walls. Put men on the left side, women on the right." Now we have the "square" of square dancing. Two of the couples are called "heads" and the other two "sides," depending on their position relative to the caller. From here we learn a few more calls. While there are many different square dance calls, the caller will teach just a few at a time, and make sure you master them before moving on to something new. "Thank everyone in your square, and take a break." Well, that concludes this introduction to square dancing. 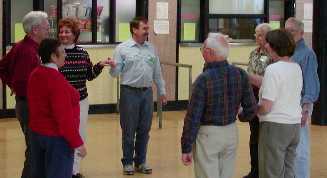 If this looks like fun to you, watch for a beginning square dance class in your area. If you live in the northern San Francisco Bay area, check our home page for announcements of a new class. Maybe we'll see you in a square!